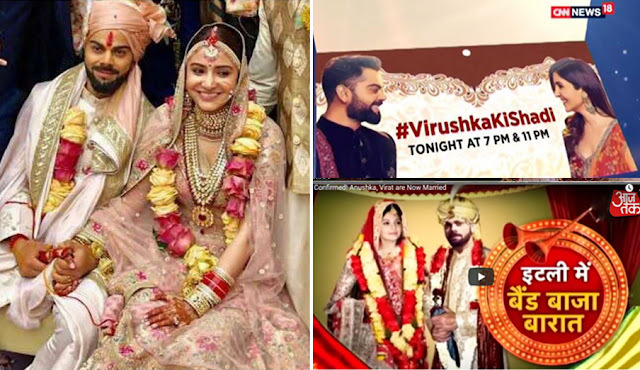 #Virushka Wedding: Made The Media Go Berserk! 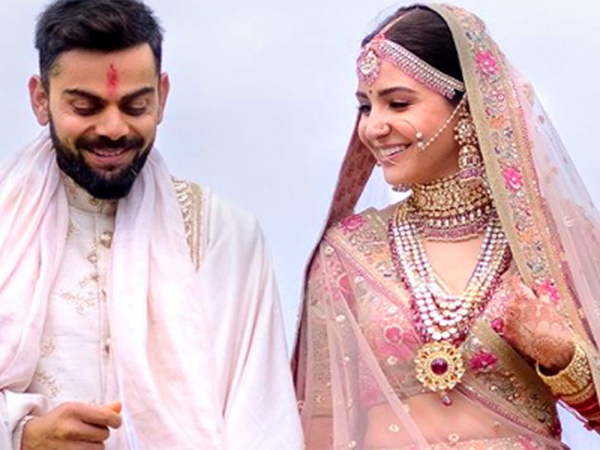 As the wedding season has kicked in, actor Anushka Sharma and cricketer Virat Kohli’s wedding has been the most talked about event in the country. The first picture of their wedding that they shared on Instagram made the media go berserk and the country couldn’t wait to get their hands on juicy inside details. 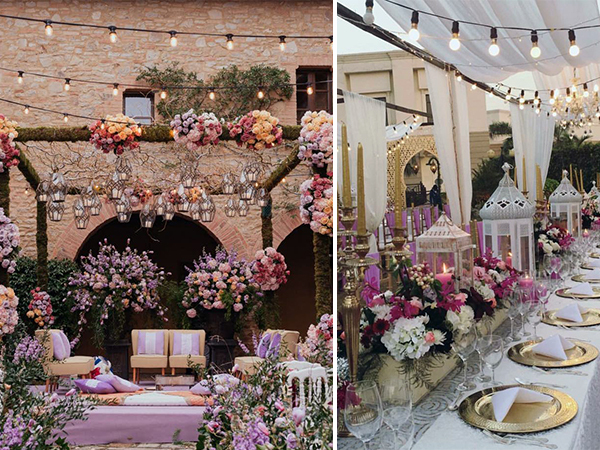 They got married in Tuscany, Italy. 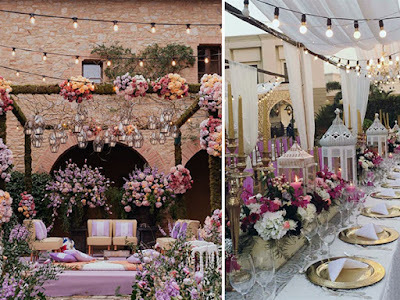 The venue was truly magical and beautifully decorated. Anushka in a previous interview said that she’d like to get married in a vineyard or an orchard perhaps or someplace close to nature. 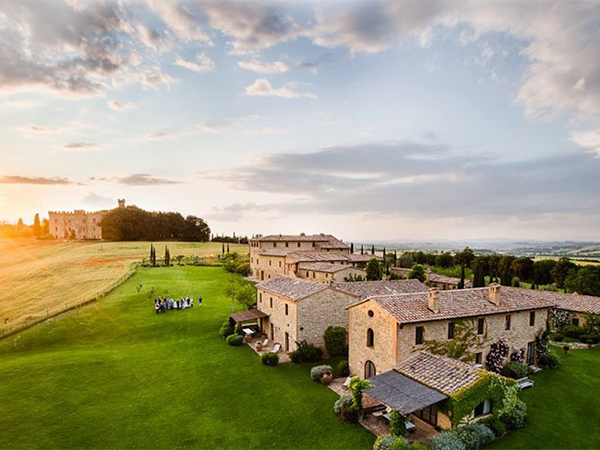 That’s exactly the kind of place that Borgo Finnochieto is, with its luscious landscape and exquisite location. The theme of the wedding was prosperity and growth and the décor and the outfits were all chosen in accordance with the theme. The bride was proudly flaunting a pale pink lehnga designed by none other than Sabyasachi Mukherjee. It is every Indian woman’s dream to wear a Sabyasachi design one day, especially on her wedding. The groom wore a sherwani well coordinated with what the bride wore. It was a hush-hush wedding, attended only by close friends and family. As breathtaking as Anushka looked Virat, however, stole the show with his at ease attitude and charm and women all over the country got their hearts broken. The couple first met on the sets of a shampoo commercial in 2013 and since then there has been no turning back. The journey was not smooth all along, there were turbulences but as they say, true love conquers all and here they are five years later tying the knot. Recent images of their honeymoon and reception invites have been flooding social media. 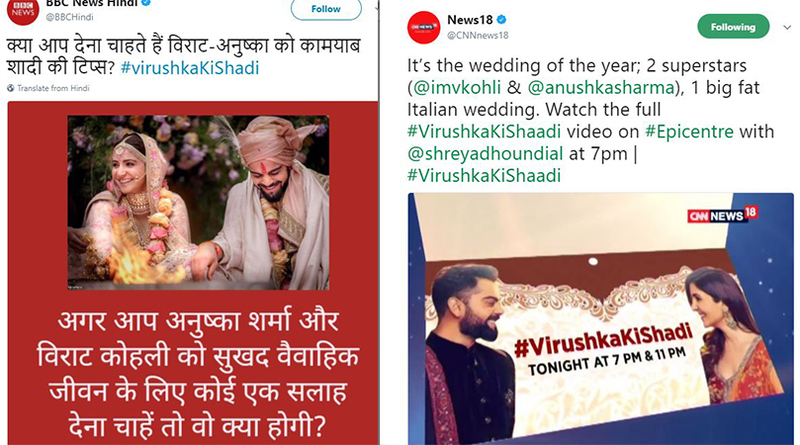 While we congratulate Virat and Anushka on starting a new chapter in their life and thank them for showing us that fairytales do come true we cannot ignore the fact that journalistic principles have been compromised with to a large extent in order to cover the story. It seems that in this age of breaking news syndrome selling the story has taken precedence over adhering to the ethics of the profession. The first and foremost principle of journalism is to inform the citizens about the concrete issues that affect the country. But what reporters do today to sell a story is they make it more salacious and sensationalize the event that was very evident in this case. The couple wanted a private wedding and everyone has the right to their own space, but reporters went the length and breadth of the world to get inside details of their wedding. They went as far as to interview the guards of the venue to get some details. Another factor where professional ethics were compromised with was the wide coverage given to the event. Social media, newspapers, news channels were all broadcasting the story of their marriage sidelining the more concrete issues that are affecting the nation currently. The news of their marriage does not concern the country, had it not come out nobody’s life would have been affected in any way. A small story somewhere in the entertainment section of the papers would have been just fine. The event is surely not front-page worthy. This episode shows how the media exaggerate and sell only gossip stories in order to attract viewers and compromise with real content. While we love our celebrities and wish well for them, literally intruding their personal space to dig your teeth into salacious details about their personal lives is certainly not journalism.